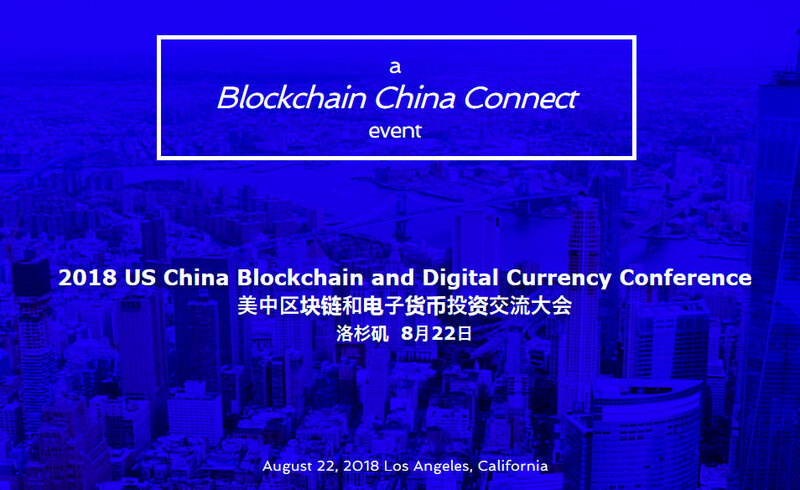 The 2018 US China Blockchain and Digital Currency Conference at LAX Marriott Hotel on August 22, 2018 is organized by Blockchain China Connect, Artisan Business Group, Inc., and partnered with FundingPost.com. Event sponsors include WONO, a reliable decentralized peer-to-peer platform for exchanging property and services and LIQNET, an exchange with unique liquidity aggregation technology. The conference is the only Sino-US investment and funding focused event for blockchain and cryptocurrency industry. Hundreds of blockchain entrepreneurs, investors, bitcoin mine operators, traders, and legal taxation experts are expected to attend, and it will provide a great platform for peer-to-peer networking and exploring investment, finance, business and collaboration opportunities between the U.S., China and other countries. More than 25 expert speakers from both countries will cover a variety of hot topics such as blockchain technology, startup investment, capital raising, ICOs, bitcoin mining, virtual currency trading, SEC compliance, legal and taxation, etc. Expert speakers and panelists include Jack Liao, Founder of Bitcoin Gold and LightningASIC; Joe Rubin, Co-Founder and Managing Director of FundingPost.com; Xiahong Lin, Founder of Bodhi; Han Liguang, Founder of RedCoin Global Public Digital Currency Exchange; Richard B. Levin, Shareholder of Polsinelli; Jeffrey Levinson, CEO of Securitech Blockchain Industries; Jor Law, Co-Founder of Verify Investor; Graeme Moore, VP of Marketing at Polymath; Matt Miles, Founder & Co-CEO of Property Coin; David W. Klasing, Founder & Managing Attorney of The Law Offices of David W. Klasing; Brian Su, CEO of Artisan Business Group; Andrew Zapotochnyi, North America Representative at CoinTraffic; Steve Anapoell, US Securities Attorney; Tyler McKay, President of Blockchain China Connect; Rob Tiv, President & COO of SonicMessenger; Gan Zhang, Partner at RTF; Harley Dou, Managing Director at Tang Wealth; Ralph Liu, Founder & CEO of MuleChain and Advanced e-Financial Technologies, Inc.; Jonathan C. Dunsmoor, Of Counsel Reid & Wise; Alexander Esaulov, Founder & CEO of WONO; Andrey Chepelev, COO of WONO; Colin Wu, CEO of Hong Kong Intellectual Property Exchange; Roc Wang, Founder & CEO of DeepChain; Pavel Cherkashin, Co-founder of Mindrock and Managing Partner of GVA Capital; Paul Dong, Founder of SunetX; Andy Wang, Founder of FutureChain Technologies. Industry media partners from China and the US will cover the event such as FundingPost.com, Fintech Finance, ShenlianCaijing, Bitcoin Chaser, ICO Buffer, SnipersTube, Bitcoin.com, 5Bite.com, 55HuDong.com, ICO Holder, Coin Delite, Blockchain Daily News, CoinMarketPlus, Belink Communications, Jgy.com, BTC Manager, Bitcoin86.com, BraveNewCoin, TheCryptoCoinCenter, The Daily Hodl, Wanlianzhijia, Chaintiao, Blockchain Business Index, Dayqkl.com, JCNNewswire.com, Adglink.com, ACNNewswire.com, CoinPoint, Smartereum, US China Business Association, NewsyPR, ICO link, and Casino Bitcoins. There will be lively discussions about the future of Bitcoin, Ethereum, Litecoin including conversation about the most popular coins in China such as NEO, VeChain, Wanchain, EOS and more. Other topics include how to attract Chinese investors for your project, marketing ICO worldwide, real estate Investing through ICOs, bitcoin trading and mining tax laws, updates on Chinese cryptocurrency regulations, and US securities & regulations impacting ICO such as Reg D., Reg S. Reg A+, KYC and AML. ICO pitch. Exhibitors and sponsors are welcome to contact us at http://www.BlockchainChinaConnect.com. This is a paid press release, which contains forward looking statements, and should be treated as advertising or promotional material. IntoCryptoNews does not endorse nor support this product/service. IntoCryptoNews is not responsible for or liable for any content, accuracy or quality within the press release.